We want to start of by thanking all of our clients, friends, families and everyone in between for bringing in the best tattoo ideas and reference for us to explore and research. It has been such an adventure and pleasure to serve Tampa, FL and beyond. We are also lucky to be located near a major port which allows us to work with clients from all over the world. The diversity of these clients allows us to see some really amazing things in regards to tattooing. Tattoo reference is so important to our process here at Tabernacle Tattoo, it helps us see where the client’s thought process is while we are creating the best custom tattoo that matches our client’s ideas and that reads well on their anatomy. Your ideas for tattoos facilitate this shop and our ability to do cool tattoos, and for that Thank you! 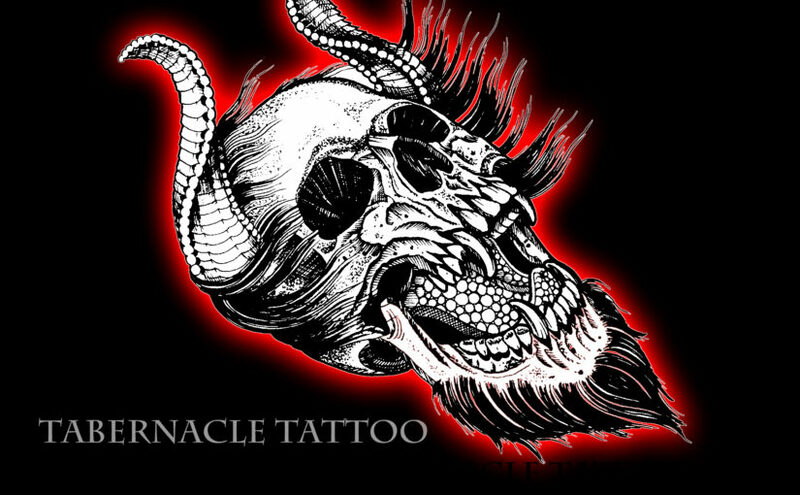 Please feel free to contact us regarding your next tattoo or any other ideas you may have we are always happy to talk to you here at Tabernacle tattoo. We have been hitting the circuit hard recently our travels have reunited us with old friends and introduced us to some new ones as well. Traveling to conventions is always fun and full of neat experiences. On our travels to the Villain Arts Philadelphia tattoo convention, the weekend of February 9th 2018, the Philadelphia Eagles had just won the Super Bowl and the city was a giant party. There were so many people in town for the Championship parade which only added to the experiences at the convention and added quite a bit of diversity to the mix, which allowed us to educate people new to tattooing on our process and studies. Many individuals at the convention were looking for Japanese and traditional tattoos which was really cool because we could talk about the classic imagery that has made tattooing last for centuries. 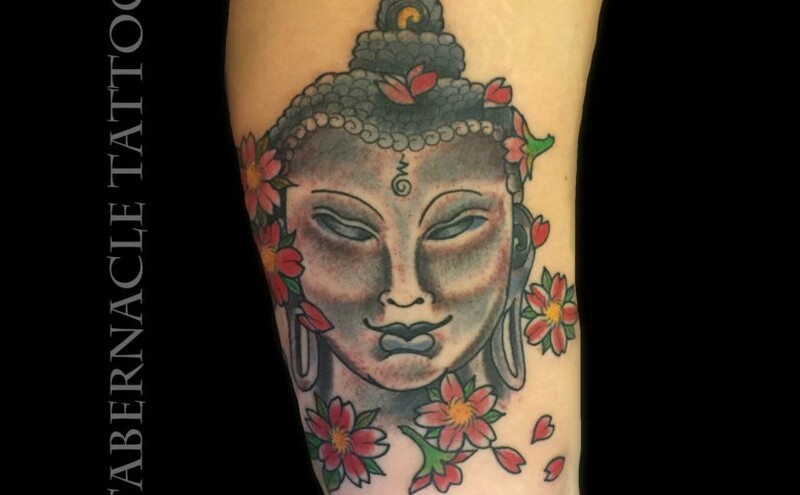 As with many tattoo conventions many people come through with new ideas and concepts which gave us the opportunity to learn about the newest trends in tattooing. 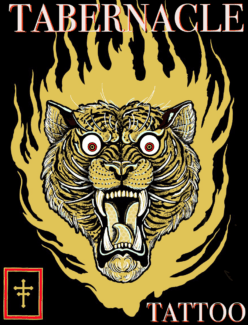 This reinforces concepts in previous blogs, the world of custom tattooing is a forever evolving field and this tattoo convention gave us the opportunity to reach out to a new as well as experienced audience. Our tattoo adventure culminated in Philadelphia, but our journey included a few stops to visit with some great tattooers and friends. We started our travels from Ybor city, FL and our first stop was to see our good friend Glen Collins of Broken Lantern tattoo in Charleston, SC. Charleston is a beautiful town that always treats us well. Next we stopped in to see a former coworker and now owner of Salt Water Tattoo in Virginia Beach, Mike Rickards. We used to work together at Ancient Arts Tattoo owned by J.D. Crowe. Finally, we met up with the illusive Mike Sikes of Eye Speak in Fairfax, VA to catch up for a little bit before heading into Philadelphia and our final destination. 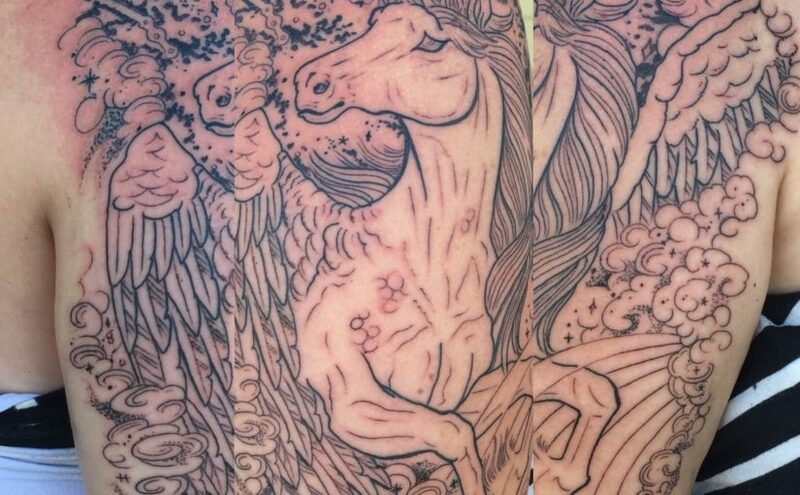 It seems that pop culture is influencing the world of tattooing in a series of new directions. There will always be the traditional tattoos that stand the test of time however, new cultural norms always pop up and create new fun ideas for the artists. We pride ourselves in researching and studying the designs and the potential anatomical movements of these new school tattoos. Newer designs such as dot work and geometrical patterns are in high demand and as a high end tattoo shop it is our duty to be able to provide a readable innovative tattoo for the client. Attached is an innovative design based on the geometric tattoo concepts in conjunction with Nordic ideologies. 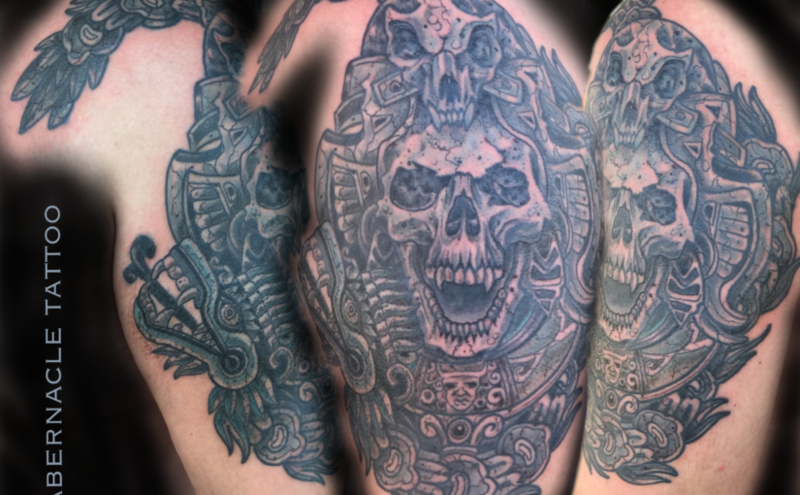 This black and grey tattoo was a ton of fun to study and put together for the client. 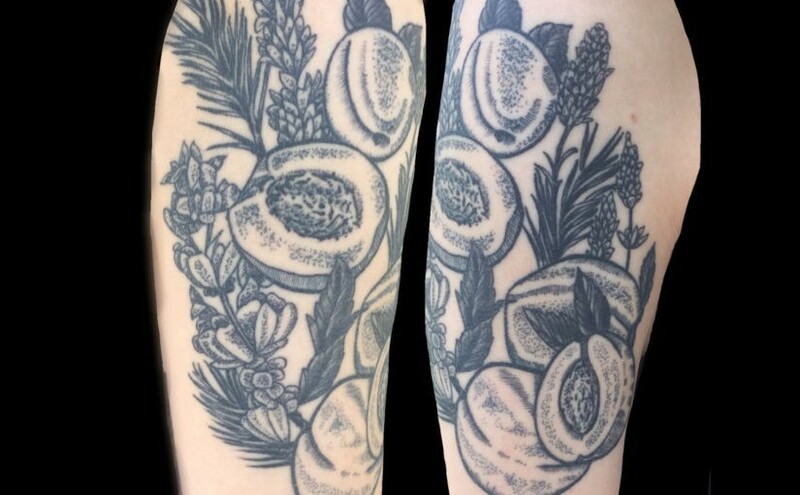 The geometric patterns in this tattoo hold strong weight and are built to last along with the Nordic influence. Tattoos like this allow us to step out of our comfort zone and grow as tattooers. Custom tattoos in 2018 are going to require heavy doses of research and studies because this is all relatively new conceptually in the grand scheme of tattooing. 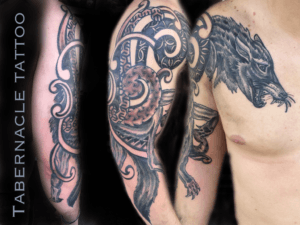 Japanese and American traditional tattoos to name a few styles have been around much longer and the studies have been performed time and time again. Physiological integrity is essential to these tattoos which is why we are looking to achieve the same effect for the geometrical and dot patterns that are so in demand in this day and age. We live in an interesting time in the tattooing industry. 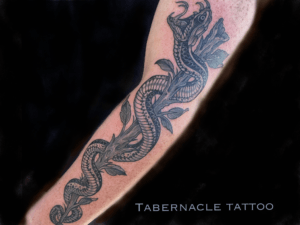 In a sense it is a golden age for the industry with so many styles and varieties of tattoos in the world, we pride ourselves in being able to accommodate all those needs here at Tabernacle Tattoo. There are many new age designs, in addition to, the traditional designs that stand the test of time. All of these images are amazing and hold value in many cultures throughout the world. When it comes to custom tattooing it is important to understand the needs of a client both through an artistic and physiological perspective so the tattoo is aesthetically pleasing. With that being said, we want to fit our clients with quality custom tattoos and take on projects big and small. We are blessed to be located in Historic Ybor City in Tampa, FL which has been a hot bed for tattooing for many years, this location allows us to meet and develop relationships with clients from all over the state of Florida and even the world. That level of diversity gives us the ability to hone our craft to all aspects of tattooing and gives us the ability to have a lot of fun doing what we love! Below are just a few tattoos I’ve been working on at the moment. At times larger more complex tattoo work takes real time, it never goes quick or easy, it’s a matter of effort on both ends, the client and myself should share the passion for tattooing in order to develop the best product. My enthusiasm and energy is always where it needs to be and I understand this is a difficult process and a test of endurance, because it takes heart and soul on both ends, but I can get you through this and in return I will put my all in to it. Many people are surprised by the amount of unfinished projects are out there under circumstances outside of my control. I really appreciate all my clients, but there is definitely something special about an individual that budgets their time and resources in a manner that allows me to purely focus on the task at hand. As crazy as it may sound, this is where the true magic happens because there is limited to zero distracting energy on the process. Tampa FL has been a fun place to tattoo there’s been a lot of really fun requests and I enjoy knowing what people want and will gladly make that happen. I understand my vision it may not be your vision, but mine is a better one for many reasons, tattooing has been my life I understand the values of tattooing and how my work can fit on someone’s anatomy in order to give them the best tattoo!!! 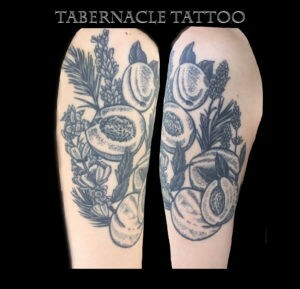 Please understand that I must take this task into my own hands to give the client and Tabernacle tattoo the best future possible. Thank you for reading my post. Feel free to comment or email with your tattoo ideas I would love to be a part of your next tattoo! This Japanese Fox tattoo represents cunning and intelligence and is being created at Tabernacle Tattoo in Tampa Florida. Long over due for a post guys we’ve been super busy at the tattoo shop in Tampa, Florida. In case you may not see what style your looking for on site we are well studied in all styles!! We enjoy the challenge of all tattoos, projects big and small, male tattoos and tattoos for females we are looking to make something real cool happen. 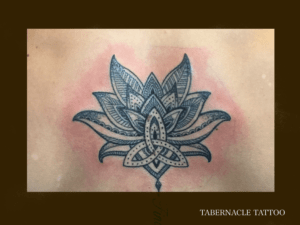 Dot work ,Tribal,Mandala tattoos and of course Japanese tattooing and traditional tattooing are just a few tattoos on the menu here at Tabernacle tattoo. We truly look forward to working with all clients of different backgrounds and tattoo ideas, we believe it proves us and the client with a lot of growth during the process. As always the best way to discuss these topics is to visit the tattoo shop here in Historic Ybor City. We are also receptive to you reaching out on the contact us page as well but it is way more fun to break down the social barriers the internet creates. Thank you for taking the time to read our post, we hope to see you soon!!!!!!! Im really finally getting the opportunity to reflect on some of the things I am truly grateful for, we have been busy at the tattoo shop and for that and our excellent clients Im truly happy. Tampa has been keeping us busy proving awesome custom tattoos but sometimes its always nice to escape one reality and enter another. I traveled to Love Hate Social Club in Cork City, Ireland which was an amazing experience, I got to tattoo a lot of really amazing people during my time there. 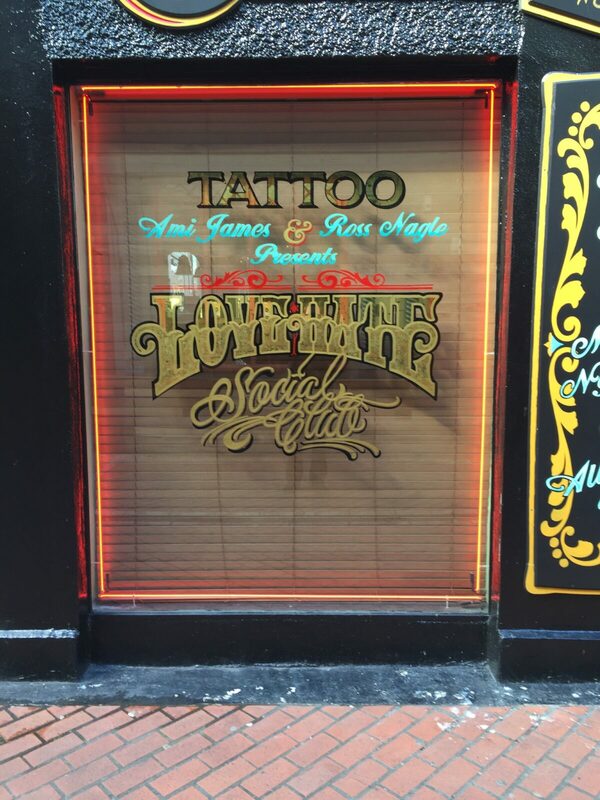 Love Hate Social Club was founded by Ami James of Miami Ink and Ross Nigel of All-Star Tattoo in Limerick City, Ireland. While I was in Ireland I had the pleasure of working with Damien Ross of Invisible NYC and Paul O’Rourke of Corazon Tattoos. On a side note, I got to see Slayer on a random night, that was such a experience. I am happy I could provide a great service and put some really cool tattoos on some really cool people in Ireland. 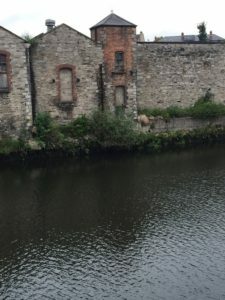 I have included a few photos of an Ireland trip to Love Hate social club in Cork City, Ireland. Couldn’t have asked for a better trip the adventures are always enlightening experiences and inspire the soul, I’m always grateful to come back to what I have, its been a really busy summer. Im working to keep up the blog a little more here’s a bit to feed the machine !! Thank you for reading my post feel free to comment and most of all come by and check out the shop!!!! 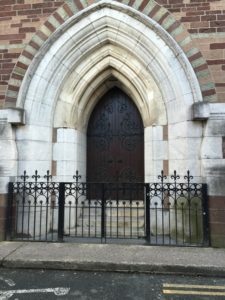 This is my trip to St Patrick’s Cathedral in Dublin Ireland.